There is no doubt development and growth result in significant costs for a municipality.For example the present infrastructure was built to accommodate buildings and population existing at the time. Depending upon its age, it is necessary constantly to replace and upgrade:this is the case with Oak Bay’s hundred year old sewer, storm drain and road systems. Also, our neglected infrastructure is not the whole, growth-related expense story. 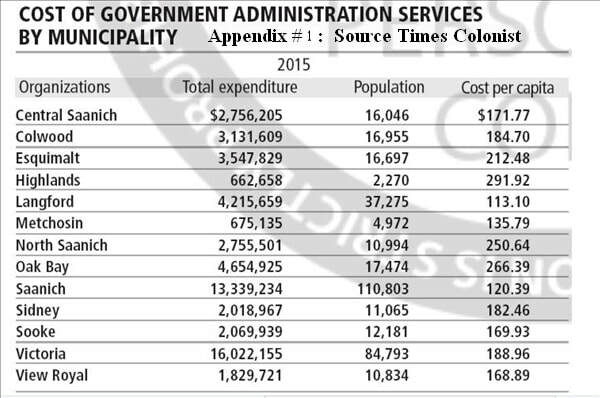 Someone must pay for the new municipal staff, expanded services, community amenities, and traffic control devices etc. This is why even the most pro-development governments authorize municipalities to offset some of these costs by charging Community Amenity Contributions (CACs) and Development Cost Charges (DCCs). Adequate fees for development permits are another way to pay for the costs associated with growth. At present the District‘s staffing costs for administering new developments is far from revenue neutral. This Council has expanded the planning department by two thirds, and allocated hundreds of thousands of tax dollars on consultants to aid development. This has made the already bad fiscal situation even worse for taxpayers. If growth occurs too quickly it drives up costs, and thereby eliminates any tax benefit. Almost all municipalities help finance their growth by DCC and CAC charges. How is our Council managing this issue for residents? First, Oak Bay does not charge DCCs nor do they have a CAC payment schedule: worse still, Council has been subsidizing new development off-site services for many years now. Second, most CRD Municipalities collected hundreds of thousands of dollars in development service fees generally in 2016, while Oak Bay Council in comparison has not collected anything. Oak Bay’s existing residents should not be subsidizing growth and development. Oak Bay has a failing infrastructure, very high administration staffing costs (see attachment #1) and four Council members who are approving over-building. These development initiatives: multi-family dwelling units, subdivisions and houses that are too big for the lot are only part of the problem. Several hundred thousand dollars to legalize infill development have also been allocated. All this without the essential development fees, or fee schedules in place: how will this impact Oak Bay’s future? It should be pointed out that half of Council - Councilors Braithwaite, Murdoch and Zhelka, are against these over-development initiatives. They have repeatedly proposed what should be the obvious first step of developing an overall Housing Strategy, before moving ahead. This would provide an analysis of demographics and the economics of growth. Then the development impacts and who is going to pay for them would be established. The main reason for Oak Bay‘s hiring a planner was to develop such a Housing Strategy. A large part of the October 16, 2017 Council Committee of the Whole (COW) Meeting was taken up by discussing options for Bike Lanes in and around Bowker/Cadboro Bay Road and Oak Bay High School. Some of the main issues discussed were losing much of the existing on street parking, the amount of traffic that will be diverted down residential streets and, of course, the safety concerns. However, one could not help wondering why this important bicycle lane initiative and all of its associated impacts discussed at the COW meeting, had not been presented at the Bowker/Cadboro Bay condominium development meetings attended by so many residents? After all, this development was just approved earlier this year and will impact the immediate area. Won’t the 43 new units, businesses and coffee shop add a lot more traffic to the area and require much of the remainder of the already stressed but soon to be diminished on-street parking. Also on the agenda were 6 development applications that involved variances, home modifications and a new build. The Advisory Planning Commission recommended Council deny two of the applications. One of the recommended rejections was on the basis of concerns about the illegal demolition of an older character home and the number of variances being requested. As no demolition permit had been applied for nor building plan submitted, the Commission stated if a new home were to be built, there was no reason for its not complying with the zoning bylaw. Council members chose to ignore the Advisory Planning Commission’s recommendations and approved both applications. The Mayor indicated he was happy with the demolition application as the community would now have a brand new home. The gist of Councilor Kirby’s remarks can be summed up by, “these things happen”. Councilor Zhelka was concerned that the decision to demolish was made as a result of the owner’s engineer’s report that recommended demolition over the approved renovation. He queried why this report was not made available to Council, particularly when a power point presentation just listing the reasons for the un-permitted demolition was. Councilor Braithwaite provided the best, most logical perspective in voicing her objections and voting against approval of the application. She explained that she was standing up for all the residents that obey the zoning rules. Now there will be nothing stopping other developers from demolishing a home and paying the small $400 fine and thereby not have to go through the demolition approval process. Even if this application were beneficial in some way, future illegal demolitions can have very harmful impacts. The Advisory Planning Commission’s (APC) record shows it heavily favours development. Therefore when it recommends rejecting an application (as in the present case) it is an indicator there were some strong reasons for doing so. It is disturbing that Council consistently disregards the Advisory Planning Commission’s recommendations to deny applications, yet Council approves all, or almost all, development applications the APC supports. The question that must be asked is, “What purpose, if any, is served by a Planning Commission that so many residents worked hard to establish”?